Women’s March on Washington D.C.
On January 21, 2017, over 600 women's marches took place around the world, signalling the start of an enduring movement of solidarity and protest. Voices were going to be heard. Contributing Editor to So It Goes, Brianna Lance, took to the streets of the capital, and here’s what she saw. At the heart of the global protest was the US capital, Washington D.C. For so long a symbol of democracy and liberty, the political epicentre of the world now has the all too real clouds of autocracy hovering above it. Today started with a simple Facebook flyer, but marchers numbered an extraordinary 500,000 men and women who took the streets to speak up against the Trump Agenda. Pulling into the parking lot even before getting to the march felt immense and overwhelming. A field of buses that seemed endless parked as people clad in pink hats and holding picket signs flooded out. All you had to do was jump into the stream and follow it, for about 2miles to reach the rally. Constantly amongst the chanting were updates with numbers: “300,000", “500,000”," "1.8million globally!". This was big and it was worldwide. And yet, however immense the crowd was, it was peaceful. 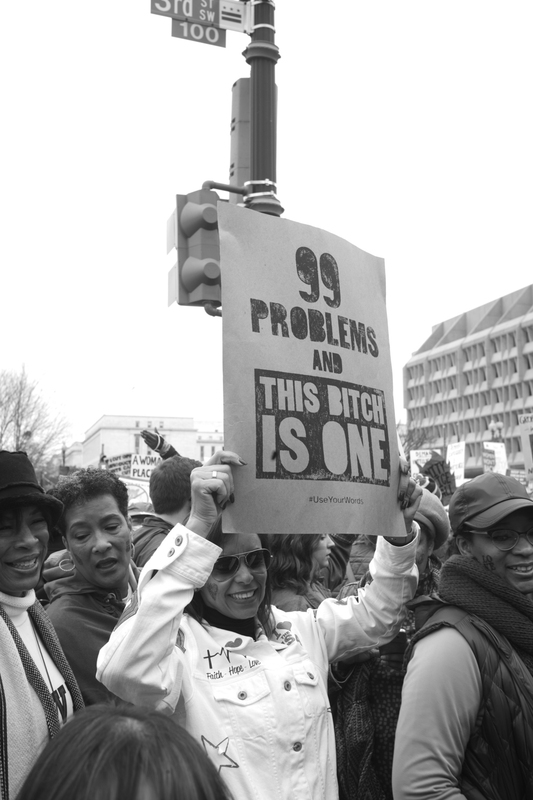 The opposition to the march was invisible, and residents of D.C. took to their yards to great and cheer on the crowd. It seemed like people were taking back the hope they had lost. "Women's Rights Are Human Rights," "Love Trumps Hate," were echoed on signs and in chants. Historic activists Gloria Steinem, and Angela Davis took to the stage to speak, as well as Madonna, Michael Moore, and Alicia Keys, her voice reverberating the importance of the day. You will have seen the graphics and the already endlessly recycled aerial shots – over twice as many Americans showed up for a day of protest than for the previous day, the presidential inauguration. Trump’s win was totemic and earth-shattering, but the loss of the Electoral College was writ large today in Washington. He was not the President of so many here today. This was its own inauguration, issuing in an era of protest and activism. It was a strong day for womankind.